Today Hurghada is known as a party town, particularly among Europeans. Locals and others will tell you that life begins at night in Hurghada, with the many, many clubs. They are particularly frequented by the young, but certainly many others of all ages. One may often find a rousing party centered around the visitors from a tour group taking over the action of a particular bar. They are easy to find along the main street, along with loads of inexpensive and expensive hotels. It is also a beach resort, where thousands of older Europeans and others come with their families to enjoy the sun and fun of private resort beaches, some are all inclusive. Many of these hotels offer so many activities and facilities that one may never need to leave the resort. Often, the larger resorts have zoos, playgrounds, discos, bars, a number of pools and even small theaters. Hurghada is also a city under development. Many new hotels and construction are taking place and we can expect to see some great new hotels, restaurants and other facilities in the nearest future. Actually this is a busy section of the Red Sea in general. Safaga is just to the south of Hurghada and Soma Bay with its beautiful Sheraton is even closer to the South. 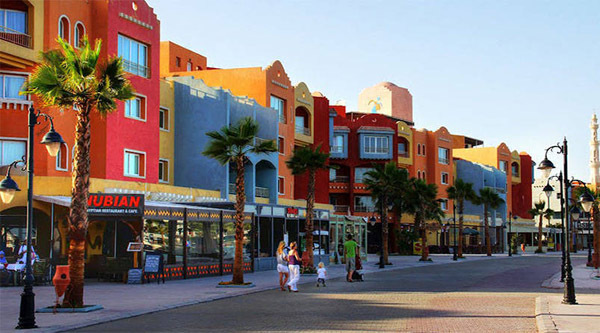 To the North is El Gouna, a highly organized resort community. Together, these communities and resort areas offer just about everything a visitor might wish for, from raucous parties to isolated scuba diving, with golf, bowling and fishing in between. Islands near Hurghada offer all kinds of fun and excitement. Take a day trip to Giftun Island for snorkeling and a fish barbecue, or view the Red Sea from a submarine! When you're not in the sea you can make shopping in the boutiques, relax in the luxury holiday villages or visit the Roman Mons Porphyrites (mountain of porphyry) remains at nearby Gebel Abu Dukhan (Father of Smoke). Day-trips or safaris to explore the Red Sea Mountains by camel or jeep are also available. Other nearby islands and destinations include the Shadwan Island (Diving, snorkeling, fishing but no swimming), Shaab Abu Shiban (Diving, snorkeling and swimming), Shaab el-Erg (Diving, fishing and snorkeling), Umm Gammar Island (Diving and snorkeling), Shasb Saghir Umm Gammae (Diving), Careless Reef (Diving), Abu Ramada Island (Diving), Shaab Abu Ramada (Fishing), Dishet el-Dhaba (Beaches and swimming), Shaab Abu Hashish (Beaches, diving, snorkeling, swimming and fishing), Sharm el-Arab (Diving, swimming and fishing and Abu Minqar Island (Beaches and swimming).